In his Atlantic essay, Karl Taro Greenfeld laments his 13-year-old daughter's heavy homework load. As an eighth grader at a New York middle school, Greenfeld’s daughter averaged about three hours of homework per night and adopted mantras like “memorization, not rationalization” to help her get it all done. Tales of the homework-burdened American student have become common, but are these stories the exception or the rule? A 2007 Metlife study found that 45 percent of students in grades three to 12 spend more than an hour a night doing homework, including the six percent of students who report spending more than three hours a night on their homework. In the 2002-2003 school year, a study out of the University of Michigan found that American students ages six through 17 spent three hours and 38 minutes per week doing homework. 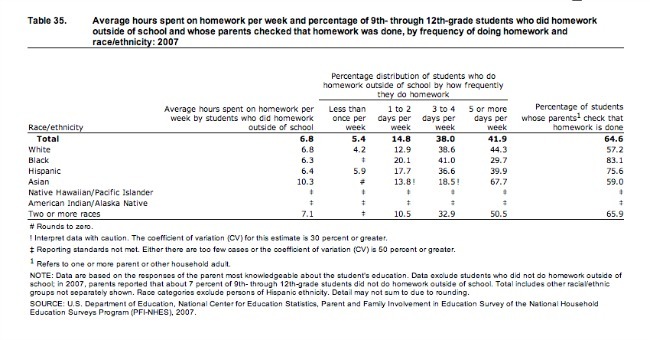 Older students do more homework than their younger counterparts. This one is fairly obvious: The National Education Association recommends that homework time increase by ten minutes per year in school. 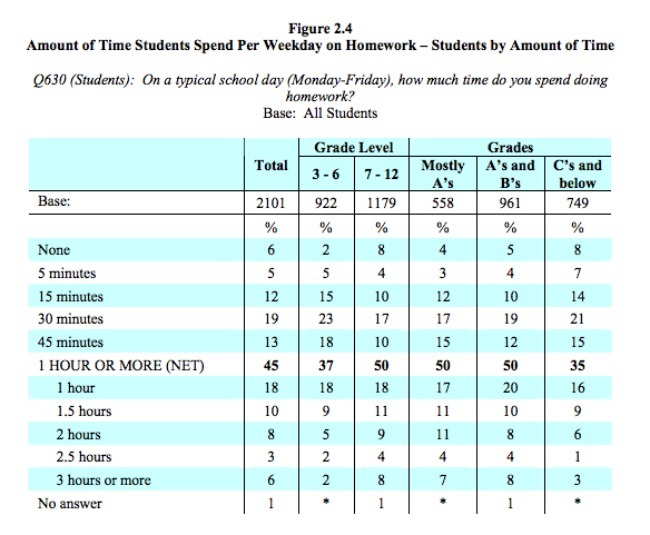 (e.g., A third grader would have 30 minutes of homework, while a seventh grader would have 70 minutes). Studies have found that schools tend to roughly follow these guidelines: The University of Michigan found that students ages six to eight spend 29 minutes doing homework per night while 15- to 17-year-old students spend 50 minutes doing homework. The Metlife study also found that 50 percent of students in grades seven to 12 spent more than an hour a night on homework, while 37 percent of students in grades three to six spent an hour or more on their homework per night. The National Center for Educational Statistics found that high school students who do homework outside of school average 6.8 hours of homework per week. 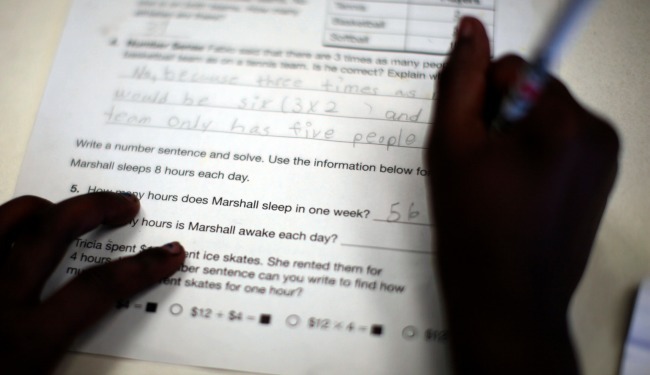 Race plays a role in how much homework students do. Teachers with less experience assign more homework. 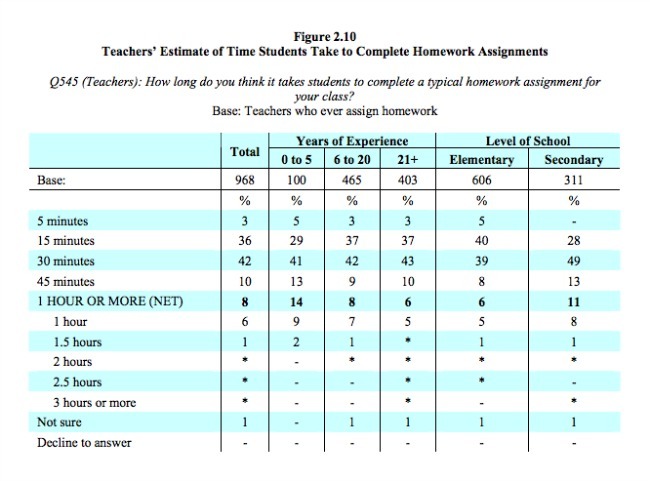 The Metlife study found that 14 percent of teachers with zero to five years of teaching experience assigned more than an hour of homework per night, while only six percent of teachers with 21 or more years of teaching experience assigned over an hour of homework. Math classes have homework the most frequently. The Metlife study found that 70 percent of students in grades three to 12 had at least one homework assignment in math. Sixty-two percent had at least one homework assignment in a language arts class (English, reading, spelling, or creative writing courses) and 42 percent had at least one in a science class. Regardless of how much homework kids are actually doing every night, most parents and teachers are happy with the way things are: 60 percent of parents think that their children have the “right amount of homework,” and 73 percent of teachers think their school assigns the right amount of homework. Students, however, are not necessarily on board: 38 percent of students in grades seven through 12 and 28 percent of students in grades three through six report being “very often/often” stressed out by their homework.